It is said that while bottoms are events, but tops are processes. Translated, markets bottom out when panic sets in, and therefore they can be more easily identifiable. By contrast, market tops form when a series of conditions come together, but not necessarily all at the same time. As a result, I am publishing another edition of "things you don't see at market bottoms". Political operative and former Clinton advisor James Carville once quipped that he wanted to be reincarnated as the bond market so that he could intimidate everybody. Equity investors and traders are well advised to remember that comment, as there is much to be learned from a cross-asset, or inter-market, viewpoint from bond market action. For example, the relative performance of junk bonds is a terrific indicator of overall risk appetite. The relative performance of financial stocks is also related to the yield curve, with the caveat that any analysis using a single variable can lead to erroneous conclusions as there may be other factors at play. The shape of the yield curve is also correlated with the relative performance of value and growth stocks. That relationship makes sense, as a flattening yield curve (falling green line) is the bond market's signal of slowing growth expectations. In an environment where growth is scarce, growth stocks should outperform, and vice versa. 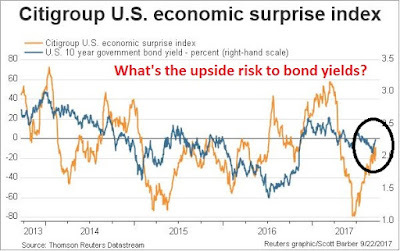 So what is the bond market telling us now? The Fed has spoken. Janet Yellen made it clear that the Fed is ready to normalize monetary policy, come hell or high water. This tone to US monetary policy begs the question of how much interest rates can rise. The Citigroup Economic Surprise Index (ESI), which measures whether high frequency economic releases are beating or missing expectations, has been on a tear for the last few months. In the past, rising ESI values have put upward pressure on bond yields (blue line). How far can they go up this time, and what kind of effects will they have on stock prices? Moreover, there are a number of indications that the Fed will become increasingly hawkish, and the trajectory of interest rate increases discounted by the market are well below actual Fed actions. I had highlighted an unusual contrarian buy signal in my last post (see Round number-itis at 2500). NAAIM sentiment, which is reported weekly, turned anomalously bearish last week and fell below its lower Bollinger Band. Past episodes of such occurrences have turned out to be very good contrarian buy signals. The reading last week was anomalous because every other sentiment indicator had become more bullish, while NAAIM RIAs got more bearish. 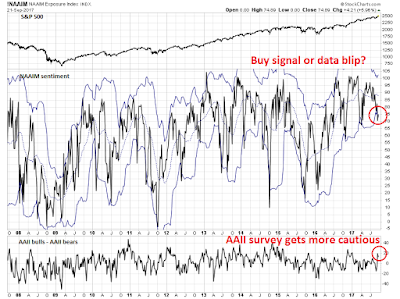 This week, NAAIM managers turned more bullish, while the AAII survey became more cautious. 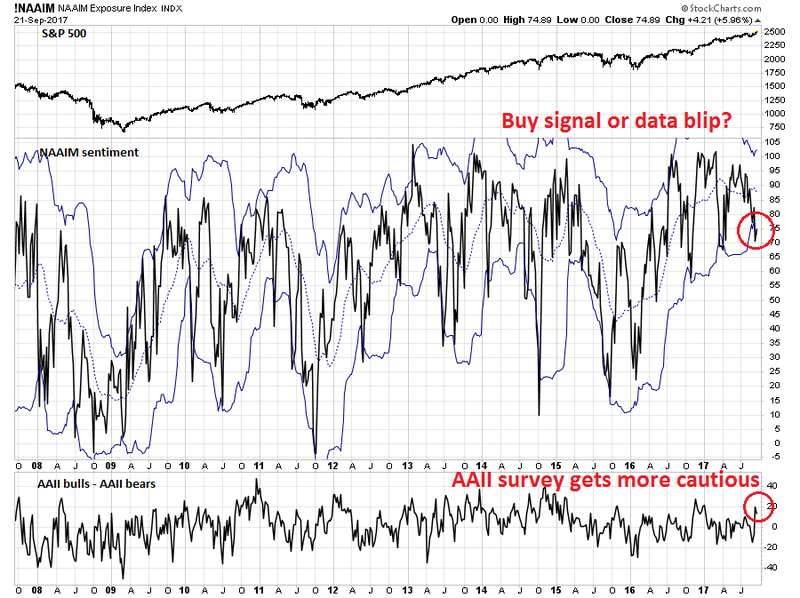 Was last week's contrarian buy signal for real, or a data blip? Mid-week market update: I normally write my mid-week market update on Wednesday, but the market action on FOMC decision days tend to be wildcards and not necessarily indicative of future market direction, therefore I am writing my commentary a day early. 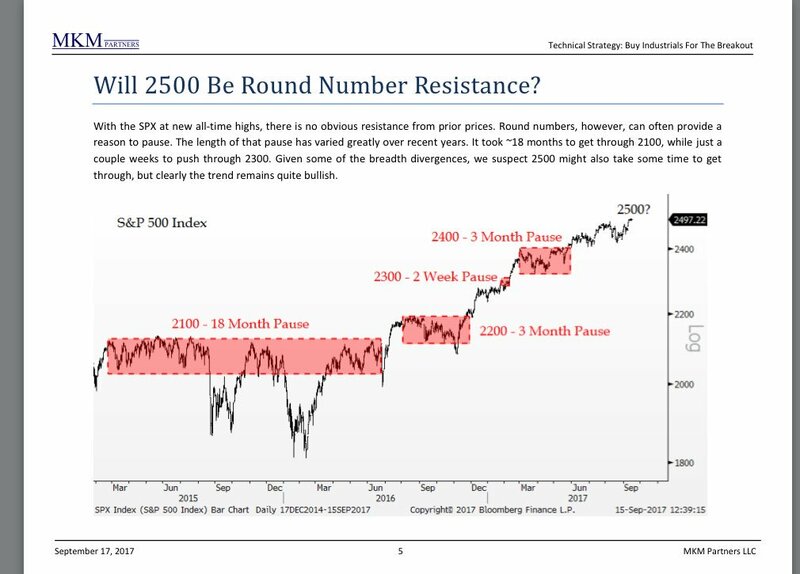 I agree with Jonathan Krinsky of MKM Partners when he wrote that the stock market is likely to encounter some resistance at SPX 2500, but the intermediate term remains bullish. There are a number of strong negative seasonal factors at work, as well as some short-term overbought indicators that point to either a period of consolidation or shallow pullback. That said, I discovered a little noticed but unusual sentiment buy signal that has historically resolved itself bullishly in the past. A secular bottom for inflation? This chart has been floating around since July and was featured in a Marketwatch article. 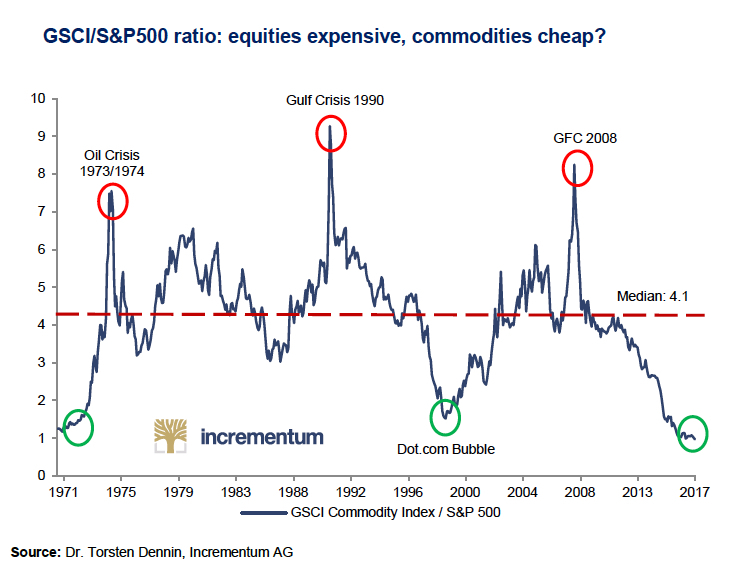 While it is interesting from the viewpoint of a chartist, the stretched relationship between stocks and commodities is difficult to reconcile when seen through macro and fundamental lenses. 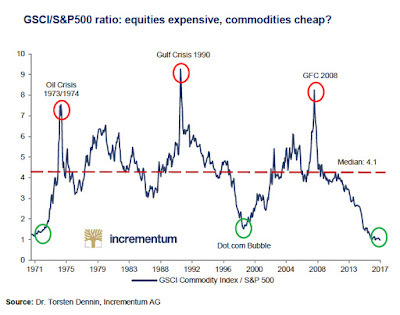 Rising commodity prices require a sustained recovery in inflation, or a collapse in the value of financial assets. How is that possible in this era of inflation undershoot and pedal-to-the-metal central bank QE? I think I found the answer, and it may be a signal of an inflection point in inflation, interest rates, and asset return patterns. 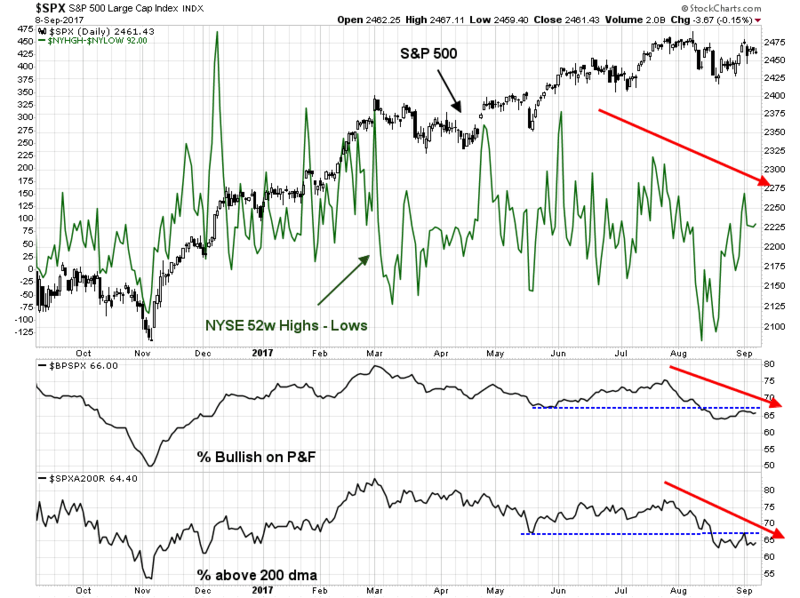 A "good overbought" advance, or an imminent pullback? Mid-week market update: A number of major averages hit fresh all-time highs this week. For traders and investors, the question is whether the market is likely to continue to grind upwards while flashing a series of "good overbought" signals, or will it pull back? Here are the bull and bear cases. I see that the world is catching up to me. The resignation of Federal Reserve vice chairman Stanley Fischer has sharpened the focus of analysts on the future composition of the Fed Board in determining the direction of monetary policy. This is a topic that I have been writing about since June (see A Fed preview: What happens in 2018?). As well, in light of leaks indicating that Gary Cohn is no longer the front runner to be the next Fed chair, there has been widespread speculation as to the identity of the next Fed chair in determining interest rate policy. A number of commentators, such as Pedro da Costa, have speculated that Trump's demand for personal loyalty is likely to usher in an era of a highly politicized Federal Reserve and destabilize the Fed's credibility. This factor is particularly acute as there will be four vacant seats on the Fed's Board of Governors after Fischer's departure - and that does not include the possible replacement for Janet Yellen. In other words, we have potential chaos at the Fed in 2018. 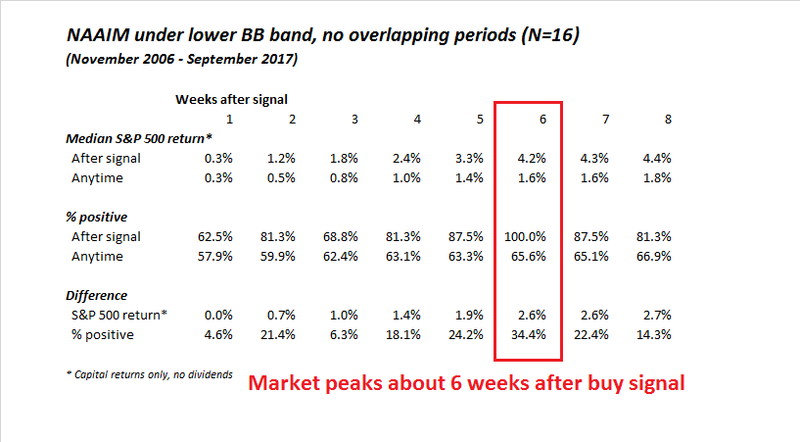 In my last post (see A step-wise market advance), I indicated that some of the concerns that overhang the stock market have been alleviated. 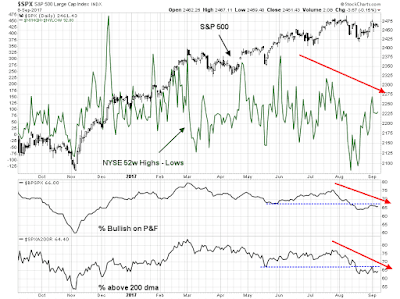 Falling risk levels should act to put a floor on stock prices. Does that mean that stock prices are ready to rocket to new highs? This week, I analyze both the near-term bull and bear cases for stocks. The bull case is based mainly on broad based fundamental momentum, such as continued improvements in ISM. The bear case, on the other hand, is based on a case of bad breadth. .The full post can be found at our new site here. 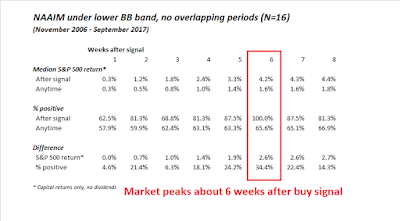 Mid-week market update: In my post written last Sunday (see September uncertainties), I outlined three disparate sources of uncertainty that faced investors in September. While some of those problems have been temporarily resolved, developments since the weekend have raised further questions about others. 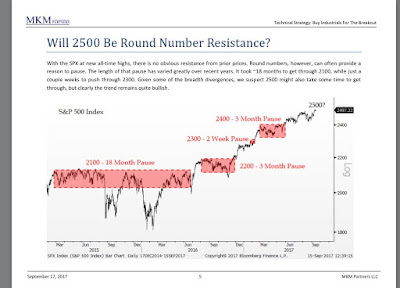 This suggests that the market will follow the recent pattern of a stepwise advance, but remain range-bound pattern until many of these uncertainties are resolved. In the wake of the news of the latest North Korean news, Donald Trump responded with his usual tweetstorm. The markets have learned that Trump doesn't necessarily follow up presidential tweets with action. Official statements, on the other hand, are another matter. In the aftermath of the North Korean missile test which overflew Japan, the statement that "all options are on the table" was far more serious and chilling. Good afternoon, ladies and gentlemen. We had a small group, a national security meeting today with the president and the vice president, about the latest provocation on the Korean Peninsula. We have many military options. The president wanted to be briefed on each one of them. We made clear that we have the ability to defend ourselves and our allies, South Korea and Japan, from any attack. And our commitments among the allies are ironclad: Any threat to the United States or its territories, including Guam, or our allies, will be met with a massive military response. A response both effective and overwhelming. Kim Jong-Un should take heed of the United Nations Security Council's unified voice. All members unanimously agreed on the threat North Korea poses, and they remain unanimous in their commitment to the denuclearization of the Korean Peninsula. Because we are not looking to the total annihilation of a country, namely North Korea. But as I said, we have many options to do so. Thank you very much, ladies and gentlemen. Any threat to the US or its allies will be met with "a massive military response". How should investors react in the face of escalating tensions? Is the world on the brink of nuclear war, or another Korean war? Welcome to September. Looking forward, this month is known to be seasonally bearish. 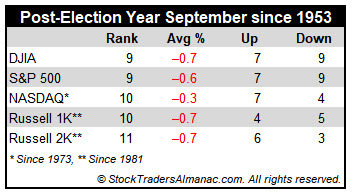 Jeff Hirsch of Trader`s Almanac found that September was the worst month of the year, based on seasonal factors. Ryan Detrick of LPL Financial Research further dissected past September seasonality. While while returns have been negative, he found a silver lining. When the SPX is trading above its 200 dma, which it is today, the market has seen positive average returns, though the percentage positive is still below 50% at 47.9%. Can stock prices climb the proverbial wall of worry in September, or will it retreat and test its correction lows seen in August?